Starring: Kevin Bacon, Radha Mitchell, Lucy Fry, David Mazouz, and more. *Deep dark scary horror movie voice* When the music stops and the lights go out… Kevin Bacon must kick off the dancing shoes and face……. ‘The Darkness’. Okay, that was a horrible intro but I swear it is not half as horrible as this movie. Damn, wait, did I just spoil my opinion section? Oh well… Friday the 13th of May 2016 brings on the release of ‘The Darkness’ starring Kevin Bacon where his family must do battle with ancient spirits of the Grand Canyon… No, I am not making this up. Just keep reading, thanks. ‘The Darkness’ begins as Peter Taylor (Kevin Bacon) and his family have a camping trip within the Grand Canyon. During this trip, Peter’s kids, Stephanie and Michael (Lucy Fry and David Mazouz) go exploring some trails with family friend Andrew (Parker Mack). While exploring, Andrew and Stephanie continue their exploration while Michael decides to stay back. An incident causes Michael to fall through a hole which leads him into some old caves below the canyon. These caves navigate to a shrine of some sort which consists of five stones. Intrigued by these stones, Michael takes them for himself which only leads to a living nightmare for the Taylor family as these stones bring terrible misfortune to those who posses it. Thus beginning the horror sequence that is ‘The Darkness’. Sorry, I spoiled my opinion already. 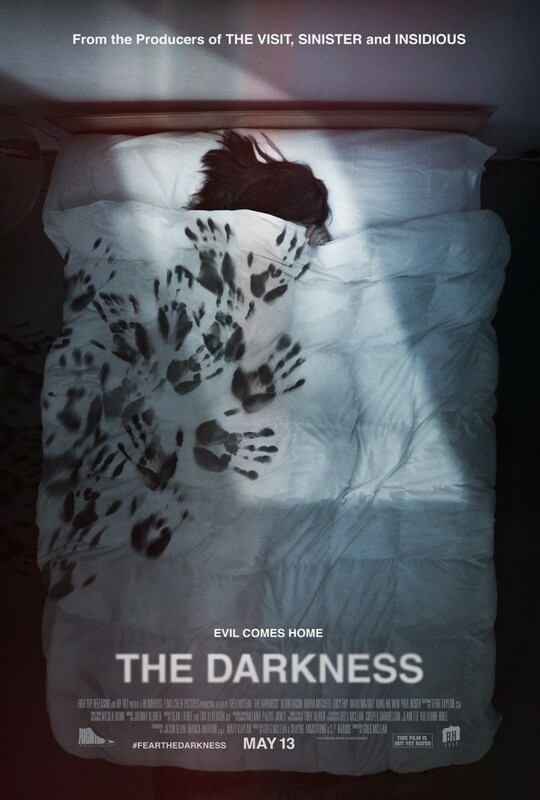 ‘The Darkness’ is yet another film victimized by my favorite term, “Hollywood Horror”. Except ironically enough, it hardly had any typical Hollywood Horror pathetic jump scares, which is an issue all in itself. This plot was all over the place as the core story was focused on the evil Michael brings upon the family. Yet, there were random inserts of inner family turmoil spread across the film for pointless reasons whether it had anything to do with this “darkness” that was taking hold of the family or if it truly was pointlessly inserted into the film. Regardless, a terrible attempt at a linear plot. To give it any kind of positive feedback, I would say it was very odd. Odd enough to give it some credit yet still too odd for my taste. Again, overall bad. Yet another movie that if you are in desperate need of a date night horror movie or want to have a “bad movie” day/night, well, you have your winner. Posted in 2016 Movies, Movie Review.Tagged David Mazouz, Greg Mclean, Kevin Bacon, Lucy Fry, Radha Mitchell, The Darkness.